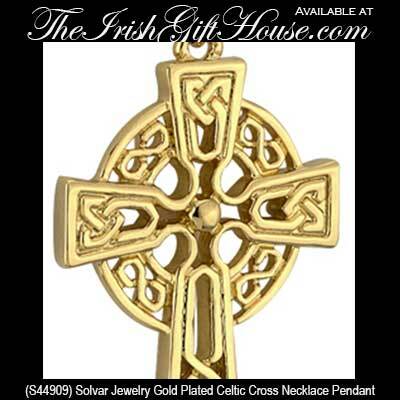 Celtic cross is a gold plated pendant that features a Claddagh in the center along with filigree knot-work. 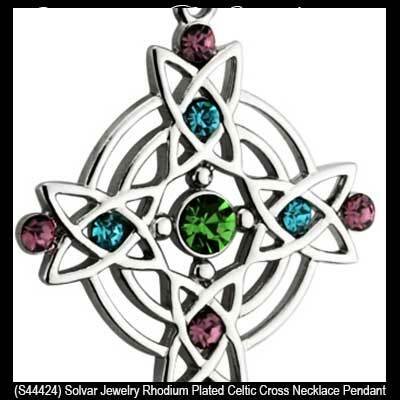 Celtic cross necklace is a rhodium plated design that features filigree knot-work along with colorful glass stones. Small Celtic cross necklace features a gold plated finish that is enhanced with embossed knot-work. Celtic cross necklace is a large design that features an antiqued silver plated finish along with multi-colored glass stones. Celtic cross pendant is a small gold plated design that features an open knot-work design on both sides. 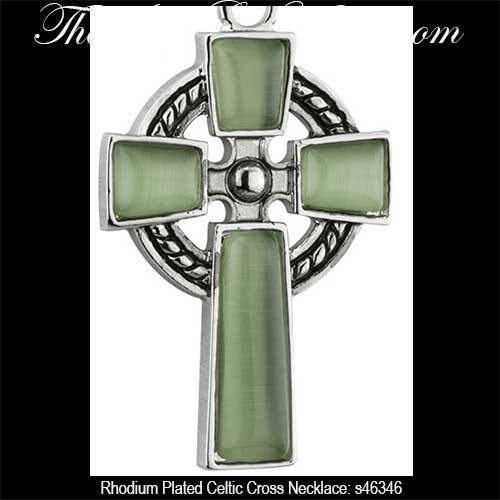 Celtic cross necklace is a rhodium plated design that features green cat eye glass along with oxidized accenting. 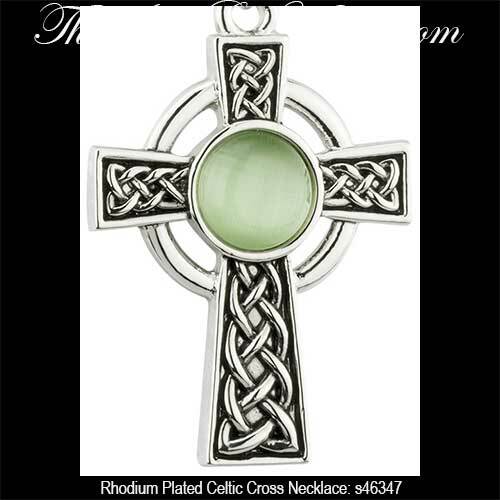 Celtic cross necklace is a rhodium plated design that features a center dome of green cat eye glass along with oxidized knot-work in the arms. Celtic cross necklace is a gold plated design that features green enameled arms. This Celtic cross necklace, that is finished in 18K plated gold, features a filigree Trinity knot at the end of each arm. 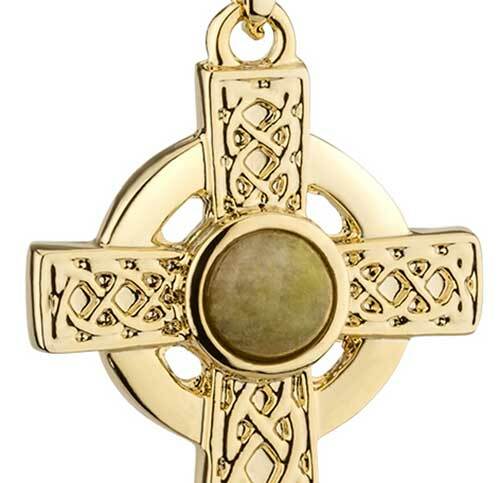 Celtic cross pendant is a gold plated design that features embossed knot-work along with a polished dome of Connemara marble. Celtic cross pendant is a plated design that features embossed knot-work along with a polished dome of Connemara marble. Celtic cross pendant is a rhodium plated design that is enhanced with gold plated filigree knot-work. 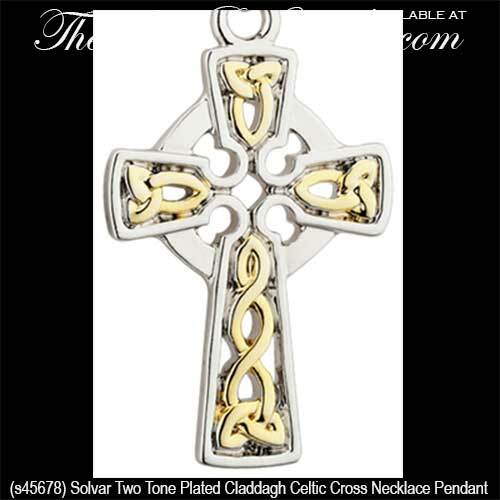 Celtic cross is a gold plated design that features two rhodium plated Trinity knots in the center of the pendant. 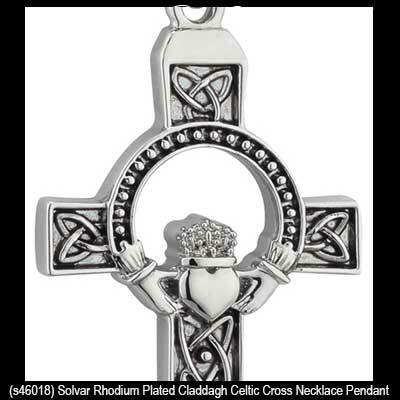 Celtic cross necklace is a rhodium plated design that features the Claddagh symbol along with embossed Trinity knots. Gold plated celtic cross features an open Trinity knot design on both sides of the necklace. Celtic cross pendant is a plated design that feature crystals along with an open Trinity knot design. Celtic cross necklace is a rhodium plated design that features a filigree knot-work design along with enamel accenting and crystals. 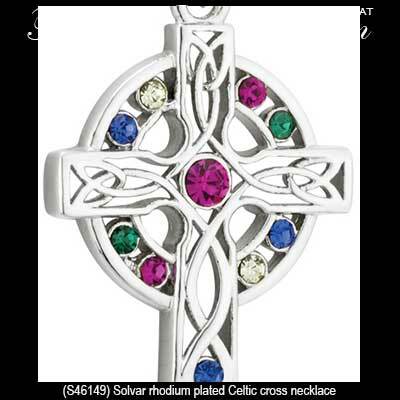 This rhodium plated Celtic cross is enhanced with enamel accenting along with white crystals. Celtic cross pendant is a plated design that is enhanced with enamel accenting along with crystals. Celtic cross necklace is a two tone plated design that features Trinity knots. Celtic cross necklace features a superimposed gold plated cross over a rhodium plated design. 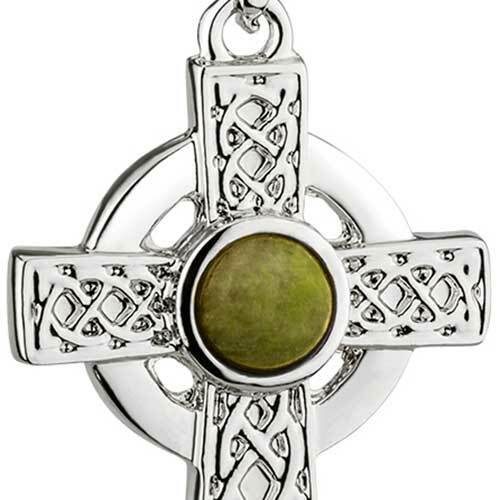 Celtic cross pendant is a silver plated design that feature Trinity knots along with a green glass stone in the center. Celtic cross necklace is a gold plated design that features a shamrock in the center, and is further enhanced with glass stones. Celtic cross necklace is a silver plated design that features a shamrock in the center and is further enhanced with glass stones. 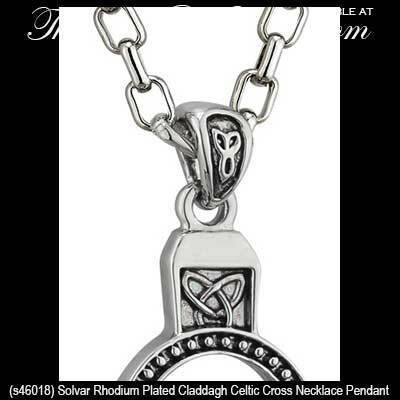 Irish necklace is a rhodium plated disk with oxidized accenting that features a gold plated Celtic cross in the center. This assortment of plated Celtic cross necklaces includes silver tone, gold plated and two tone combinations of this iconic Irish symbol that The Irish Gift House also features in precious metals. You may find our gold Celtic cross necklaces and our sterling silver Celtic cross necklaces within this same section of our site. 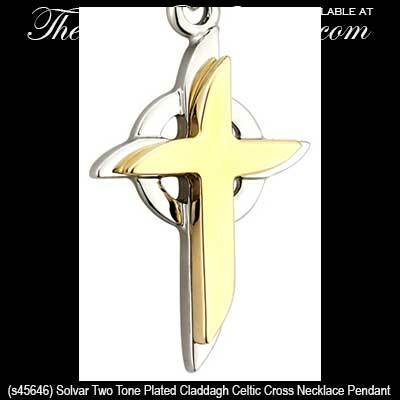 These plated Celtic cross pendants are made in Ireland by either Solvar Jewelry or Tara Jewelry; both companies are based in Dublin. Additionally, several of the Connemara marble crosses are made by All That Glisters in Co. Kilkenny.